The SAR DM on Nutrition supported the testing of innovative ideas across South Asia to deliver improved nutrition services to pregnant and lactating women and children under two. The India DM is focused on identifying Inclusive Business Models that can scale impact in the States of Bihar, Rajasthan and Orissa. Inclusive business models are those offering goods/ services and contributing to income generation of the poor in financially sustainable and scalable ways. They productively integrate those living at the base of the economic pyramid into their value chains as consumers, producers and/or distributors. Even though Chinese law offers farmers protection from land grabs, readjustments, and other confiscations, news reports paint a different picture of embattled farmers defending their land from local officials working in concert with developers. In fact, every year 3-4 million farmers lose their property to land readjustments and other forms of compulsory forfeiture in China. Many of these farmers do not know their legal rights. According to independent surveys, fewer than 30% of farmers have heard of China’s Property Law, the most important law governing properties, and land rights. As a result fewer than 10% of Chinese farmers ever appeal to administrative and judicial institutions when their land rights are violated. It is estimated that every Indian consumes approximately 8 kgs of plastic a year. If even 20% of the total plastic consumed gets into the waste cycle, that equals over a billion kilograms of plastic waste that will be generated in India just this year alone. The per capita figure usage has gone up from 4 Kgs per Indian in 2006 and is expected to grow to 25 Kgs of plastic used by every Indian per year by 2020. Imagine how much plastic waste we will be dealing with by 2020? Seriously alarming. Remember the film Wall E? *sigh*.. The United Nation’s Environment Program published an excellent study about Converting Waste Plastics into a Resource. 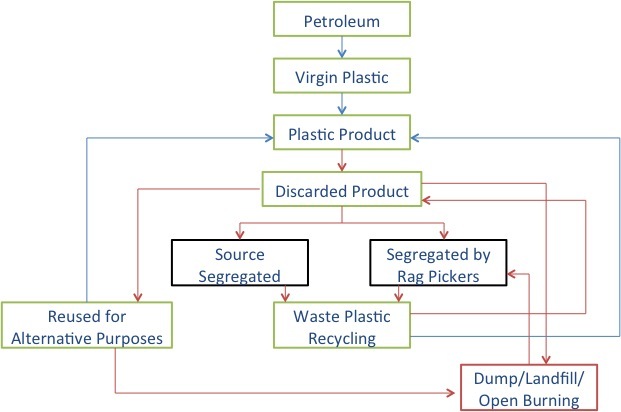 Describing the pathways for Waste Plastic, the report traces most routes, which invaribly lead to a dumping site or a land fill. If India alone is producing over a billion kilograms of plastic waste each year – the global figures are huge. While the world tries to figure out how to use less plastic – an equally important focus for Innovation will need to be: What to do with all the plastic that is already in the dumping grounds?